I first pondered if I should make a full tutorial out of this, but in the end this is not a very complex image technically (i.e. I have shown practically all the methods I use already in previous tutorials). So whereas I will roughly sketch what I did at each step, this is not really a full tutorial. See it more as fun inspiration - a glimpse as to how someone else go about making a relatively complex image, something I myself always find interesting to see. 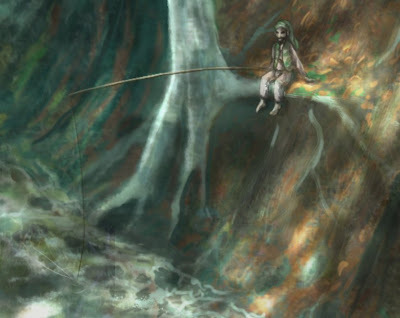 If you need more info on some of the techniques used here, ask me or, better yet, refer to my list of painting tutorials here which should cover most of this one time or another. I dreamed this scene, actually. It was part of a longer dream, but when I woke up this was the main scene that stuck in my mind. So I sat down and tried to capture it before it faded away. 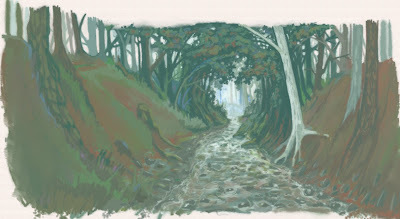 MyPaint is an open-source painting program. I reviewed the latest version 0.8 here: here. 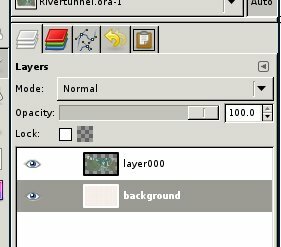 It is intended as a complement to GIMP and the two work very well together now that one can easily move .ORA files (MyPaints native file format, supporting layers) between GIMP and MyPaint with ease. Perspective lines. I used a faint paper-like texture for background (not that it matters much for the final result). 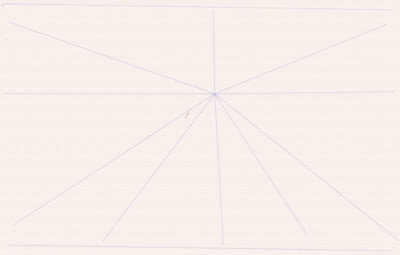 MyPaint's line tool (hold down SHIFT) is perfect for creating perspective lines since it retains the same origo as long as you hold the shift key down (as opposed to GIMP which moves the start point of your next line to be where you last let go). Here I aimed at a rather high horizon since I want us to be "down" in the riverbed. Initial geographical structure. Note that the overall structure of the scene is visible already at this stage. 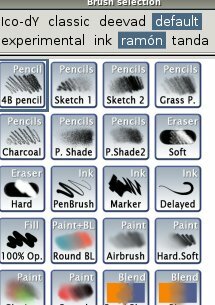 I work almost exclusively with the pencils from Ramon Miranda's MyPaint brush set that comes as default with the program (you will know him as TheShock here at GimpTalk, why not support the locals. ) The main one I used was the "Grass Pencil" one (top right). 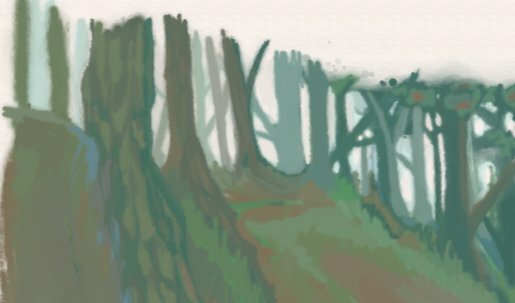 Some 90% of the image is done with this brush. 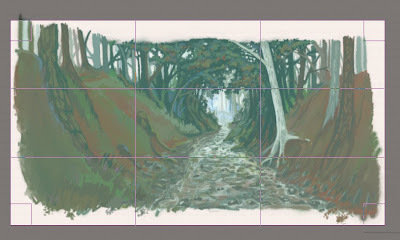 Starting to lay out the trees in more detail. 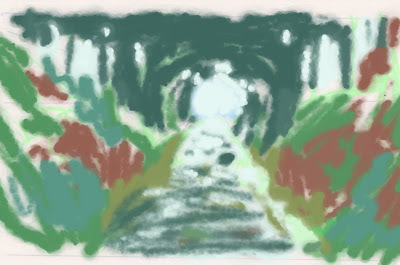 A great asset when drawing natural landscapes is, strangely enough, to have a shaky hand. Nature is not smooth or perfectly angled. 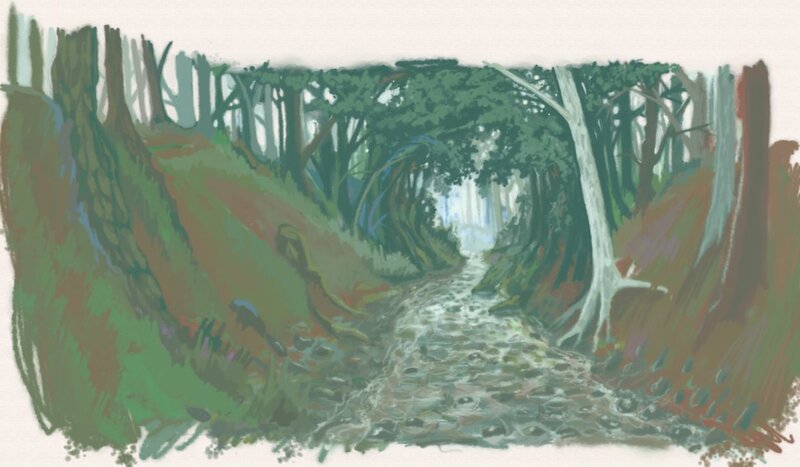 I deliberately try to make short, sloppy brush strokes and never delete, only paint over again, over and over. A critical point when doing nature is that it is not even, nor just "green". In the same sloppy, shaky lines I force some more odd purple and blue colours in there. 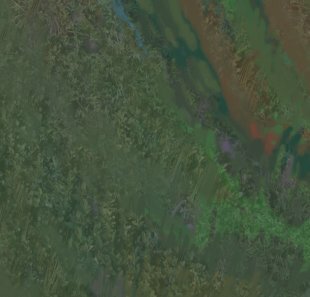 If you look at the iamge above, note how many different colours are already incoorporated into the image at this stage; (count the number of shades of green and brown in the image, for example). 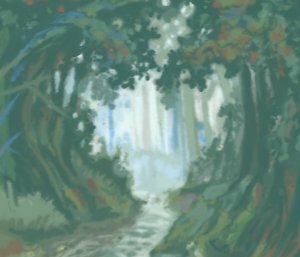 Many of these colours will only show very little in the final result, but go a long way towards making the scene more "alive". It's a vibrant growing and living environment we are aiming for here. 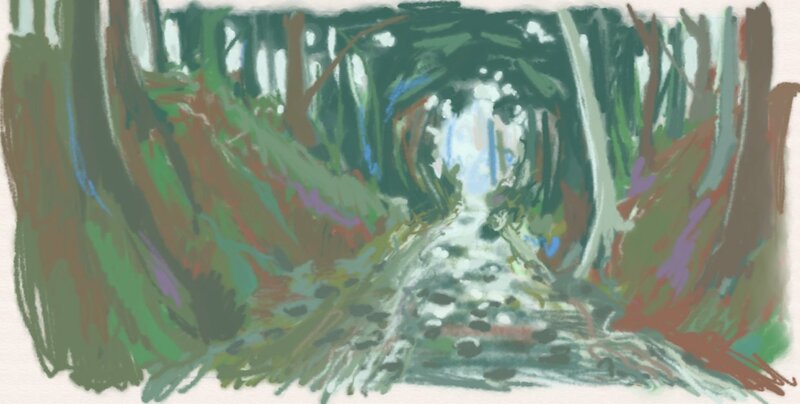 I also played with splatter brushes to create even more randomness. In the end those effects were not very visible though. Water got a lot more dark in it than one may think; since it's a transparent fluid we are actually seeing straight down to the bottom here and there - and the bottom is dark. Water is certainly not blue and never was (with the exception of very clear, deep water over a white sand bottom). I experimented with the splatter brushes to break up the water even more into a more "grainy" look, but soon abandoned this except for in a few places. The left side is intended to be a mushy sandbank where the stones of the ground has been washed free through the erosive effects of the small river. Also on the right side one can see this effect. The actual edge of the river is somewhat undertermined at this point. Many different shades go into the "water". The only reason we see that it is water is due to the reflections and the white highlights in small eddies. You can also see that further away from us the light reflect up at us at a more shallow angle, which means we see the direct reflection of the "tunnel light" mirrored in the water. As we get closer we look deeper and deeper into the fluid until the dark bottom is all we see. A simple basis for grass is to build layers of the stuff in varying colours, making sure to merge it to the ground where possible. This works fine for more distant grass/vegetation, not so well for close greenery like here. But it's a start. More planning out of the tree trunks by the water. The white birch trees make for a good contrast against all the brown around it. 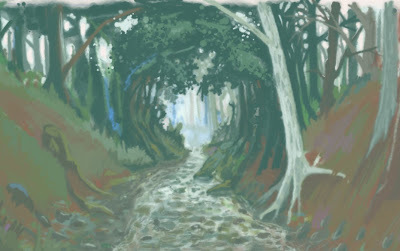 The trees in the distance are really simple; the leaves are created by a splatter brush in multiple-coloured layers to give an impression of depth. I started getting a feel for the detailed geography of the slopes at this point, I also widened the image a bit to its final width. I played with colouration and some structure in the slopes, and also added more brown and red to the more distant trees to match the ground better. Tree trunks are deceptingly simple. As long as you remember that more distant trunks should have a brighter shade (since there is more atmosphere between us and them) it's hard to miss. Combine this with some off-angle branches here and there, and a bright sky background ... and you will quickly find that the result looks quite "realistic". The more distant the trees, the brighter the trunks. In this case there is also a contrast effect between the nearby treees and the more distant ones. But each individual tree is really just a simple line, and splatches of colours added here and there. 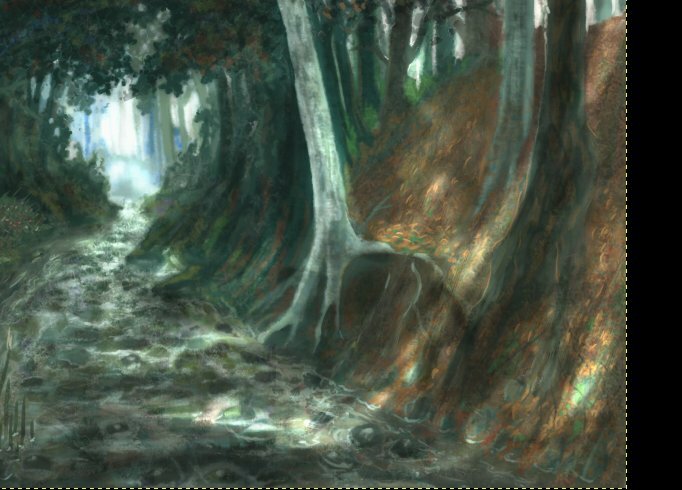 The main painting work of the image is practically done. Time to move this over from MyPaint to GIMP for the final touches. 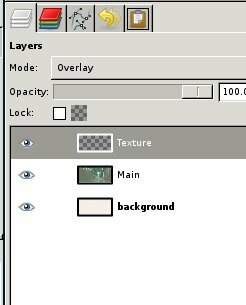 First thing we do in GIMP is to crop the image since MyPaint has an infinite canvas and no concept of a rectangle around your image. 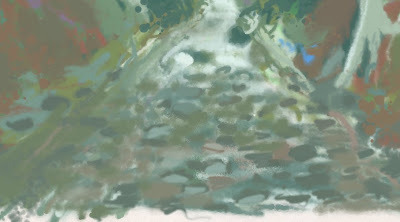 The .ORA plugin loads the MyPaint background as a separate layer in GIMP. This is fine. In our case we can just flatten the image though, we don't see the background anyway. ... There. Cropped and ready for continuing to work in GIMP. At this point I use Save As to save this as an XCF. 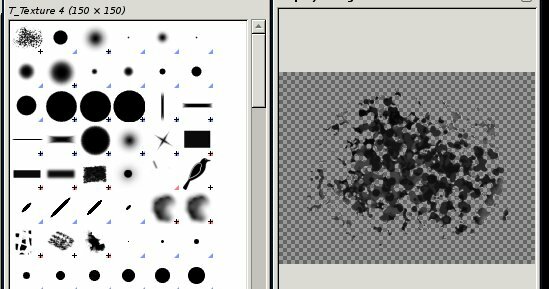 One powerful use of GIMP is applying textures to an image. I do this using an overlay layer. 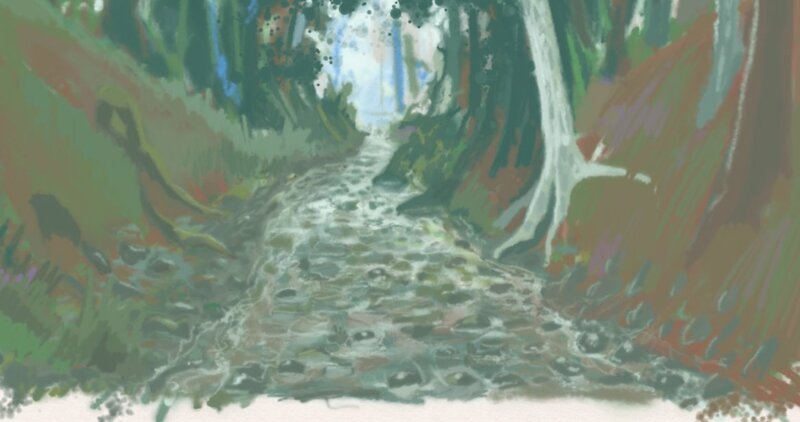 I then load a photograph of some moss which I've taken into a new layer and clone from that onto this Overlay layer. This is a close-up of the moss image being applied to the slope on the left. It is important to remember here that I'm not trying to fake my way into making it look like moss. What I am aiming for is to break up all the smooth areas of the image as much as possible. 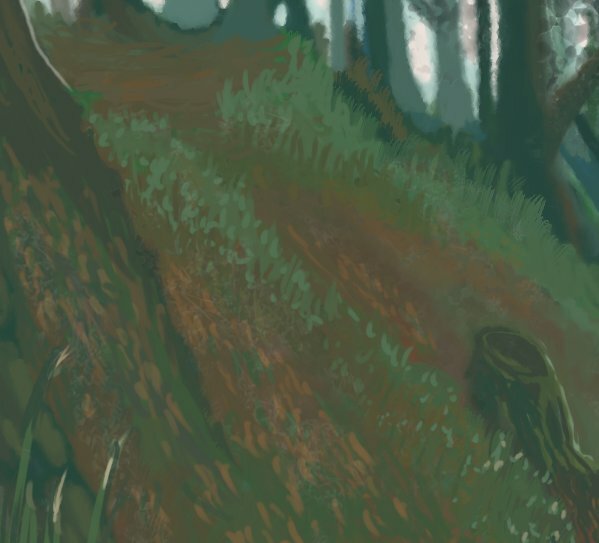 My Moss texture happened to fit, but it could just as well have been a stone texture, bark or even something abstract with the correct granularity. We want to give the impression of high detail without actually caring what the texture really shows. Thanks to the texturing the image looks a lot more detailed. For this screenshot I also made a copy of the main painting layer and added it to the old one with Multiply mode - that is why it also looks darker and more intense than before. 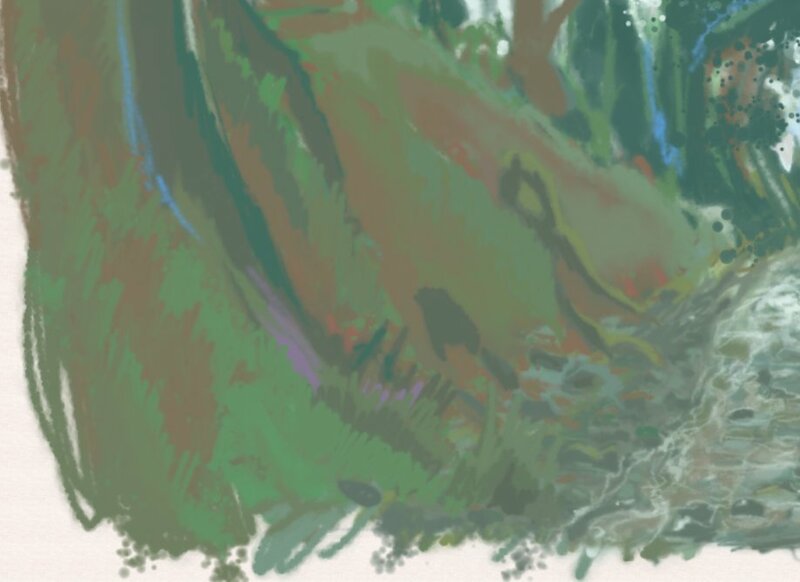 I created a few simple blobs in a new image and used that to create a quick throwaway brush with Ctrl-C (the content of the clipboard appears as a usable brush in the first position of the brush list). On a separate layer I dabbed this brush down a few times, then locked transparency so I could fill in parts of those dabs (and erase others) with orange airbrush, to give an impressive of leaves. 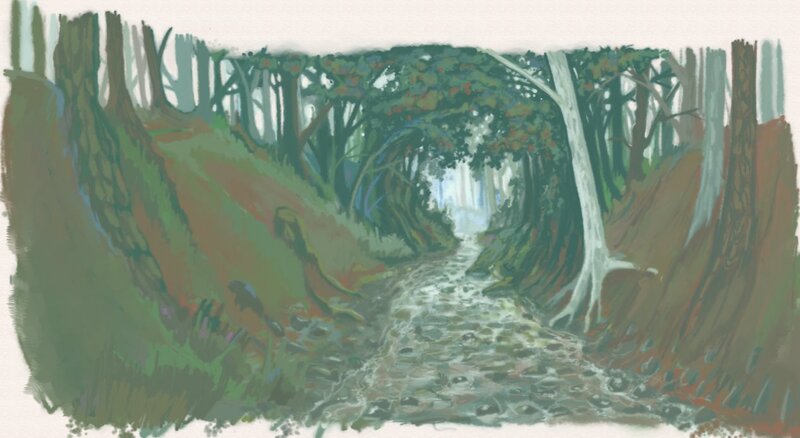 This image has that brush dab structure underneath, to form a "mat" of leaves on the ground. 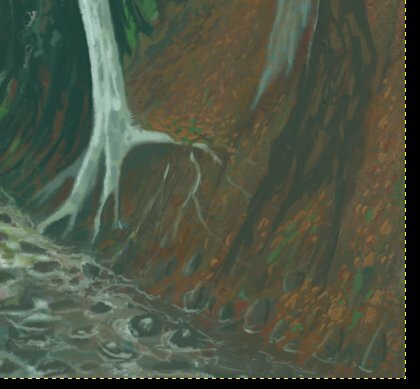 On top of that I have made small brush strokes in orange to show individual leaves. The texture layer is turned off for this screenshot to show was is being added. Same goes on the other side. The grass is made blade by blade, then dabbing the top parts with a brighter colour to give depth. The texture layer is still turned off here. The texture layer is turned back on. The detail of the ground surfaces increased dramatically, enhancing all the manual detail we already added. Adding some leaves to break the monotomy of the left slope. 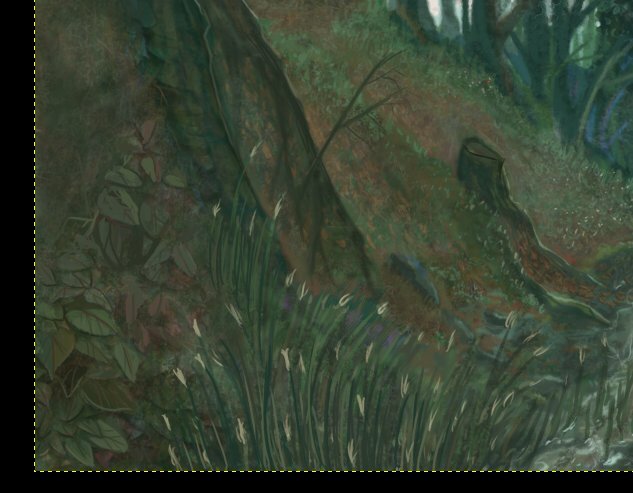 As should be clear, one can hardly make out any of the moss texture anymore, it's just there as a subtle variation in colours, leaving no surface smooth and single-coloured, just like nature. We are done with the detailing of the image. Now it's time for the final touches. I flatten the image at this point. Light. 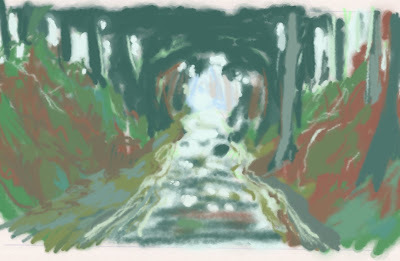 I make a copy of the image layer (just to be safe) and go to work on it with the Dodge/Burn tool and a soft brush. The light effects are all just the result of dodging the image in selective patches. All the colours we painstakingly put in there are now paying off -- as we highlight parts of the ground we are just bringing up more and more detail. I opted for rather subtle volumetric light from the upper left. 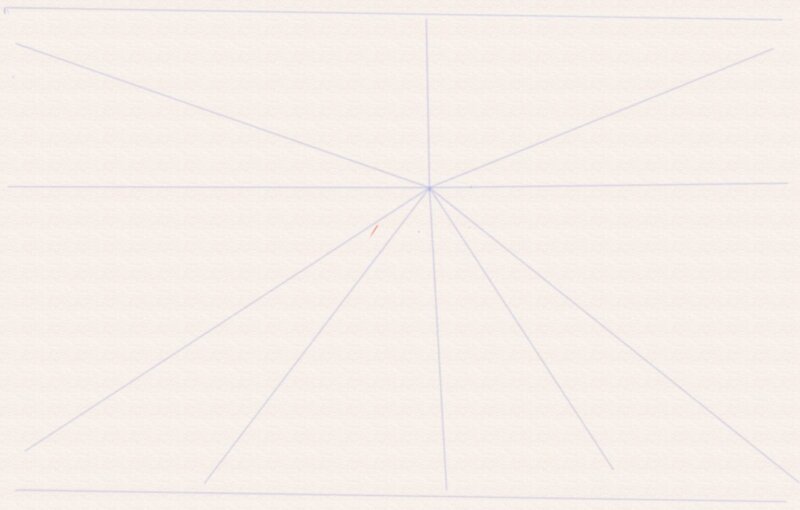 All rays are parallel since the sun is at infinite distance as far as we are concerned here. Using Burn I also selectively darkened parts of the left slope to reflect that it is partly in shadow. There is no black here, interesting enough. It's all dark green, brown or blue. The dodge tool is also great for showing blinding light around the tree trunks in the upper left. No image is complete without something "happening" in it. This is a small Scandinavian forest entity known as a "Tomte" (you have seen those in my Christmas card). Legend has it that they mostly dressed in grey or brown clothing and when there was not winter they were of course not wearing red caps, but green or brown. Seems like he found a sweet spot to fish. The finished piece. Hope this WIP sequence was enjoyable to follow at least.